Product Assemblies: We have products A, B, C, D, E, etc. We also have product X made up of 2 A�s, a C and a D. We also have Product Y made up of an H, a J and two X�s. GUIs nearly always have objects which in turn contain other objects (e.g. a Form containing a Panel containing a TextBox and a GroupBox containing radio buttons, etc). A compound Document which contains other objects, each of which can be a compound document. This is almost their defining feature in my opinion. The canonical pattern has an abstract Component class with an Add and a Remove method, each taking a Component object as a parameter; it also has a method for getting a child or a list of all children. It also has one or more methods which do something specific to the individual objects (e.g. for the GUI example a BackColor property). Leaf inherits from Component but has no children. It defines the behaviour of Components that cannot have children (e.g. TextBox, Label). Do we really need separate Leaf and Composite classes? Should Composite inherit from Leaf, and do away with Component? 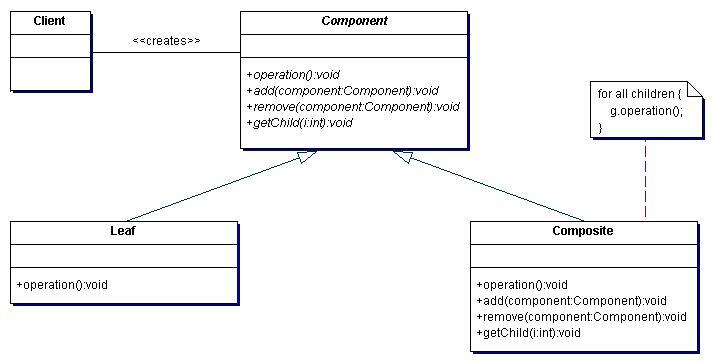 Client code has to expect the Component, not the Leaf; but this is still simple code. GoF warn that this pattern can become overly general. From http://home.earthlink.net/~huston2/dp/composite.html, various comments. Note particularly the author of the last one � one of the GoF. [This document was original the backup for a presentation which split the attendees into small groups (2 or 3) and asked them to implement in more or less detail the following specifications. A Retailer has an existing Stock Control and Order Processing system (written in C#, of course). This has an existing Product class which contains properties for Description, Price, Cost, and a ProductType (a class containing Description and Code). He wishes to introduce some new products by packaging existing ones into �kits� � for example including two pairs of ear-muffs with a toy drum. The cost of a kit will be �1 more than the sum of the cost of the individual products. The Sale Price will be the sum of the individual Prices, after a percentage has been added on to the individual product�s Price (where the percentage will depend on the ProductType of the individual product); however if this calculated price is less than 115% of the Kit�s cost, the Price will be 115% of the Kit�s cost. Assuming that you were writing a system from scratch for the above problem, how would you implement it differently? The client would look like this. The following code creates and fills a composite and then shows it in a WinFowms TreeView.